Power Systems Protective Device Coordination Part 4. 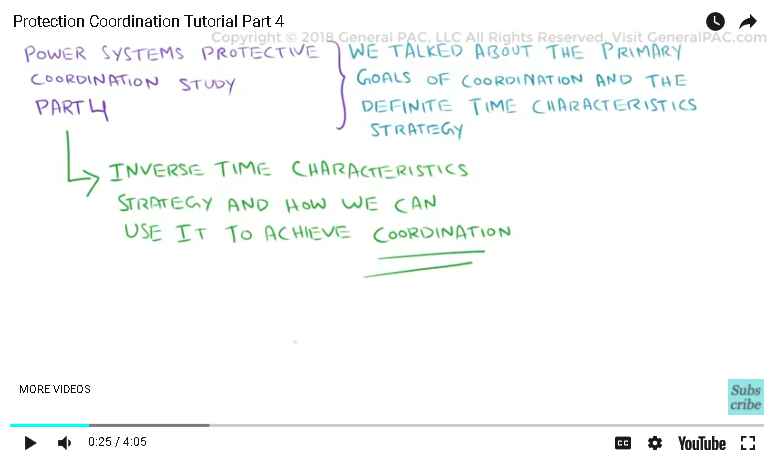 In part 3, we talked about the primary goals of coordination and the definite time characteristic strategy. In part 4, we will be discussing the “inverse time characteristics” strategy and how we can use it to achieve coordination. if this video was helpful for you, please consider subscribing to GeneralPAC.com. Our goal is to make Power Systems intuitive. 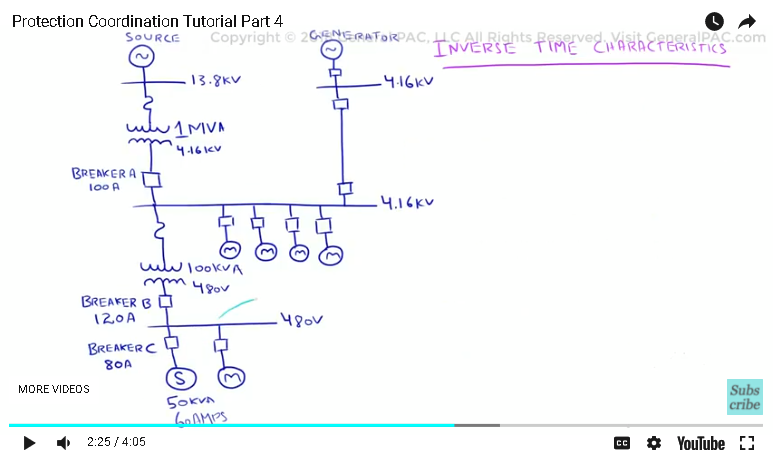 Inverse time characteristics are used to define a time delay which varies inversely with the amount of current available. As current goes up, the time delay goes down. Similarly, as the current goes down, the time delay goes up. So current and time are inversely related. The protective device performs its tripping action after the time delay has been completed. To demonstrate this concept, let us again consider a facility with a 50 KVA, 60Amps static load. As discussed in part 2, all breakers should be rated at some percentage above the full load amps of the downstream load. Breaker “C” is rated at 80 Amps at 480V, Breaker “B” is 120 Amps at 480 volts. And Breaker “A” is rated 100 Amps at 4.16 kV. The breaker amp rating is much greater when we compare all the breakers at the same voltage level. Let us consider a 3 phase fault of 20,000 Amps occurring at the load terminals beyond Breaker “C”. Under normal operating conditions, we would require Breaker “C” to trip first. If the breakers used a definite time characteristic, Breaker “C” would have a delay time of 0.30 seconds for a 20,000 Amp fault. This means that the high fault current remains on the circuit for at least 0.30 seconds, then Breaker “C” will trip to isolate the fault. If we compare this with the inverse time characteristics, a higher current level would mean a lower time delay. In the case of Breaker “C”, the delay time would be much less than 0.30 seconds. Depending on the inverse time characteristic curve of the breaker, it might trip after 0.10 seconds of delay. 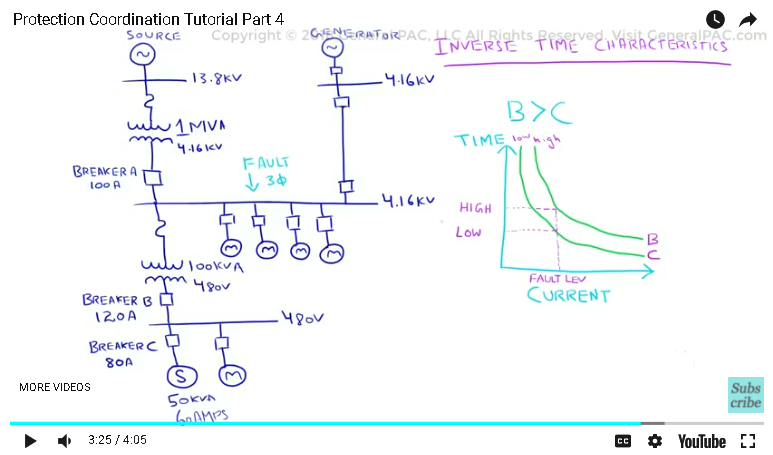 Conversely however, if the fault current was only 5,000 Amps, then the delay time would be much greater than 0.30 seconds. To understand how inverse time characteristics can be helpful in achieving coordination, let’s consider a fault between Breaker “B” and Breaker “C”. We know that the upstream Breaker “B” has a higher amp value than the downstream Breaker “C”. If we plot both curves on the same axis, we can observe a shift between the two curves. We will now draw a time characteristic curve which can be used to show the tripping characteristics of a protective device. We have the current level on the x-axis, and the trip time on the y-axis. For the same value of fault current, the upstream breaker “B” will have a higher delay time than the downstream breaker “C”. This is due to the shift in the curves. Breaker “C” picks up at a lower amp rating. While Breaker “B” picks up at a higher amp rating. This is one way to achieve coordination by using inverse time characteristics of the breakers, and the breaker amp ratings. 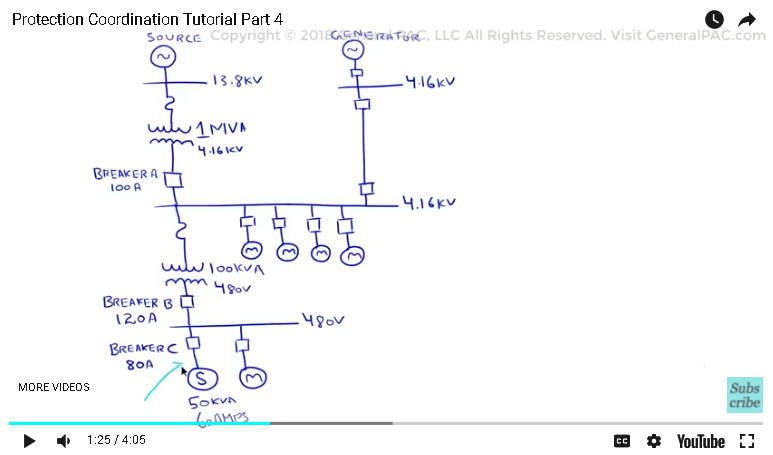 If we consider a 3 phase fault at the 4.16 KV bus which produces an abnormally high current, then this strategy would enable us to achieve coordination in the same way. For the same value of abnormal current, Breaker “A”, would be shifted furthest to the right since it has a higher amp rating. Breaker “C”, would be shifted furthest to the left since it has the lowest amp rating. Lastly, Breaker “B”, would be in the middle of Breaker “A”, and Breaker “C”, curves. In Part 5, we will be discussing the time characteristic curves in more detail. If you found this video, please consider liking and subscribing. Thank you. GeneralPAC.com – making power systems intuitive.